A teller counts money at a Kenyan bank. Mr Haji's move is likely to shake the banking industry to the core as it could see several lenders and their officials charged in relation to one graft case. The Central Bank of Kenya (CBK) has already fined the five lenders a total of Sh392 million for failing to report large transactions to the industry regulator. A source at the DCI, who is close to the probe, yesterday told the Nation that Mr Haji had embedded prosecutors within a probe team comprising officers from other agencies, including CBK and Financial Reporting Centre (FRC). The stealth movement of Sh1.054 billion, the DCI believes, was aimed at helping looters launder the funds and make a clean getaway. The 20 senior officials now targeted for prosecution failed to inform the CBK and FRC of any transactions involving the transfer or withdrawal of Sh1 million or more, in line with the Proceeds of Crime and Anti-Money Laundering Act. The Daily Nation is not revealing their identities for legal reasons. Equity Bank is the hardest hit by the investigation as the DCI wants six of its senior officials charged alongside the lender. The DCI is also targeting five officials from Standard Chartered, four from Diamond Trust, three from KCB and two from Cooperative Bank. The banks and their officials have been accused of breaching sections 3b(iii), 11(1) and 10(2) of the Proceeds of Crime and Anti-Money Laundering Act. Section 3b(iii) outlaws aiding of criminals to move money or other assets that are proceeds of crime, and the offence comes with a maximum 16-year jail sentence. Section 11(1) puts on the spot banks that fail to monitor and report large or suspicious money transactions to the CBK and FRC. Institutions that violate this law face fines of up to Sh2.5 million, while individuals could be fined and thrown in jail for up to seven years. Section 10(2) flags any individual or institution that gives false information to the CBK and FRC that could derail detection of money laundering. The crime incurs a fine of Sh1 million, a jail term of up to two years, or both. Over 40 individuals and firms were last year charged with the theft of Sh468 million from the NYS after Mr Haji indicated that prosecution will be done in batches. The scandal caused genuine firms huge losses after their supply contracts were duplicated and used to pay dubious individuals who had not delivered any goods or services to the state agency. Among those charged are former Youth Principal Secretary Lilian Omollo, former NYS director-general Richard Ndubai, ex-senior deputy director Nicholas Ahere, former acting finance officer Willington Lubira, and former chief accountant Clement Murage. Several businessmen have also been charged over the scandal. Standard Chartered received Sh1.628 billion that was paid to Firstling Supplies, Active Electrons Africa Limited, Flagstone Merchants Limited and Excella Supplies. Businessman James Thuita Nderu and his estranged wife, Ms Yvonne Wanjiku Ngugi, own the four firms. Detectives flagged Sh558.58 million that was moved with the help of five Standard Chartered officials who did not alert CBK and FRC of the large transactions. Cooperative Bank handled Sh250 million, which went to Sambeat Investments and former Kirinyaga Woman Representative Winnie Karimi Njuguna. Our source described Ms Njuguna as "politically connected" but did not substantiate. Of the Sh250 million, detectives flagged Sh25 million, which should have been reported to the CBK and FRC but was not. Payments of Sh886.42 million were also made by the State Department for Public Service and Youth Affairs on behalf of NYS to Equity Bank. Our source did not disclose who the beneficiaries were, but said the lender's officials aided the movement of Sh264 million without reporting to the relevant authorities. Another Sh800 million was wired to Kunjiwa Investments, Annwaw Enterprises, Jerrycathy Enterprises, Waluco Investments and Lucy Wambui Ngirita. The four firms are owned by Ms Ngirita, her son Jeremiah, daughters Ann and Phyllis, and her daughter-in-law Catherine Mwai. 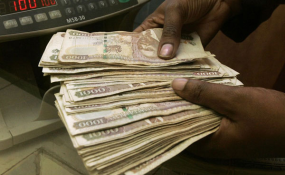 Detectives believe that close to Sh28 million of this was transacted suspiciously. The Kenya Bankers Association yesterday said it was impressed by the seriousness with which its members had treated the NYS investigations. He promised continued collaboration with the investigating agencies. "As signatories to the Code of Ethics for Business in Kenya, we are committed to working with the Government and other players in the fight against corruption," the lobby said. "While investigations of transactions undertaken by the NYS are in progress, we are pleased by the magnitude of effort with which our member banks are treating this exercise, recognising the industry implications, and look forward to a positive outcome." KCB Chief Executive Officer Joshua Oigara declined to comment on the matter, saying questions should be referred to the Kenya Bankers Association, "which speaks for all banks". Equity Bank General Manager Alex Muhia promised to respond to our questions but had not done so by the time we went to press. In May last year, when this newspaper first revealed the identities of banks that had handled the NYS transactions, most of them declined to comment on a matter under investigation. At the time, Diamond Trust Bank said it fulfils its prudence obligations in respect of all transactions. Central Bank Governor Patrick Njoroge said the theft of NYS money through fake payment vouchers was aided by the banks "deliberately". He posed: "How else could you make a mistake on things that you are aware of?" Last September, CBK said it was still monitoring another set of banks that could also be fined and its officials prosecuted.